Futures prices for corn have been decreasing a lot - for example the December 2014 contract for corn has decreased by more than 25% between the beginning of May and the beginning of August (chart of CME), indicating that the market either anticipates increased supply or a drop in demand, likely the former. Maybe good weather will be giving the US, which produces 40% of the world's corn a bumper crop. Below are the weather updates for 2014 until the end of July 2014. 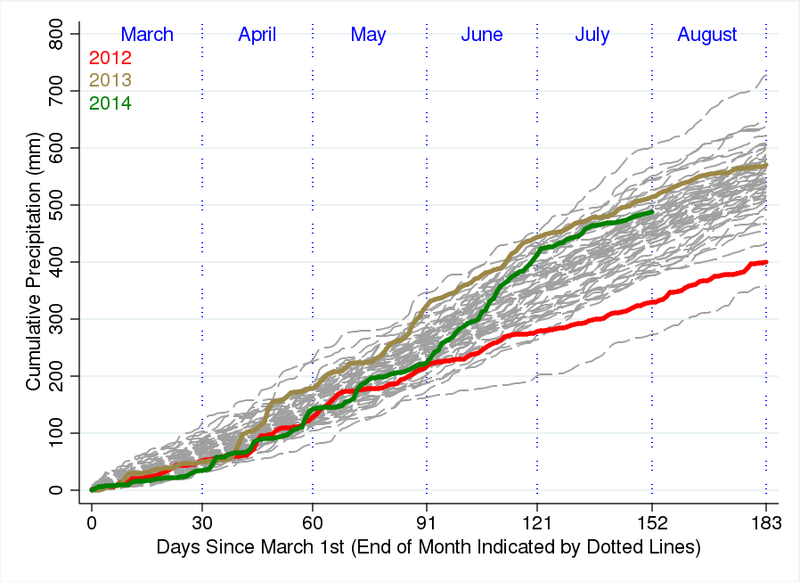 Similar to earlier posts, I graphed the cumulative degree days above 29C, which have been shown to be very detrimental for corn growth. This measure counts how much temperatures exceed 29C and for how long. For example, being half a day at 33C would result in 2degree days above 29C (0.5days x 4C). These are the weighted average of all counties in the United States, where the weight is proportional to expected production (expected yield according to trend times last reported growing area). Areas with higher yields and larger growing area get weighted more heavily. Grey lines show the historic distribution from 1950-2011, while the last three years are shown in color. 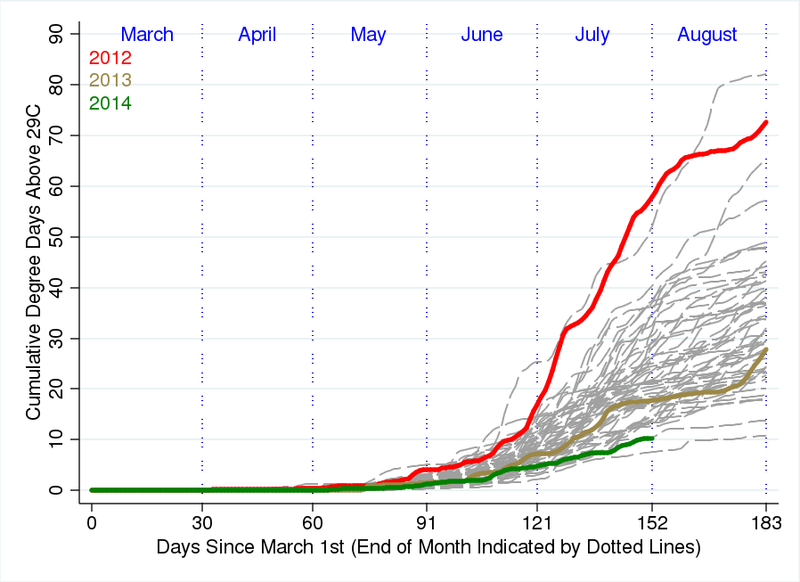 The red line shows how hot July 2012 has been - notice the sharp increase of the red line in July. By comparison, 2014 (green line) has been the second lowest total by the end of July of what we have observed in the last 65 years. This should be great for con yields, as there hasn't been much damaging heat. At the same time, it has also been slightly wetter than average. Since too wet or too dry, having close to average amount of rain is good for crops as well. Looking at these two graphs, it suggests that 2014 will be a very plentiful harvest.